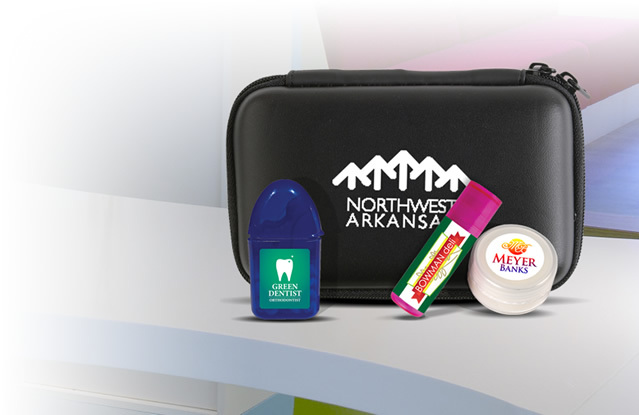 We have a host of promotional luggage bags that can prove effective for your company branding. 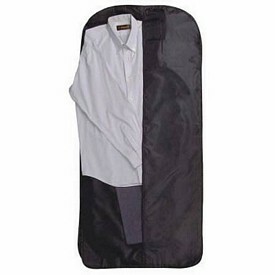 The Non-woven promotional garment bags are made of 80 gram non-woven polypropylene. 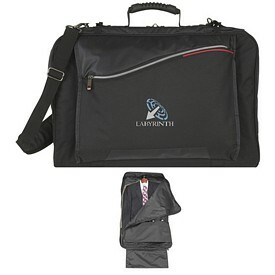 The customized executive travel bags are coated with water resistant material. 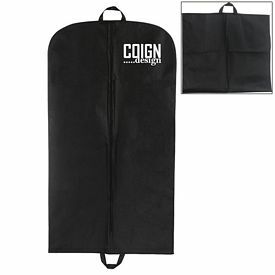 All the custom luggage bags come with a front zipper and identification window. 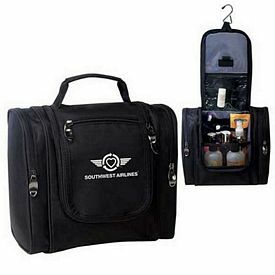 The promotional luggage bags are lightweight and extremely durable. 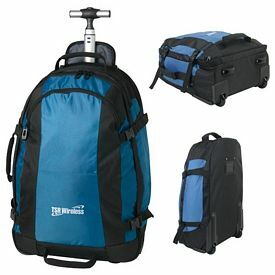 You can get the luggage bags in blue or black color. 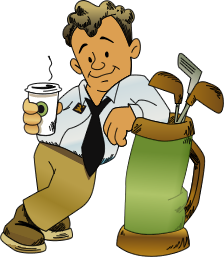 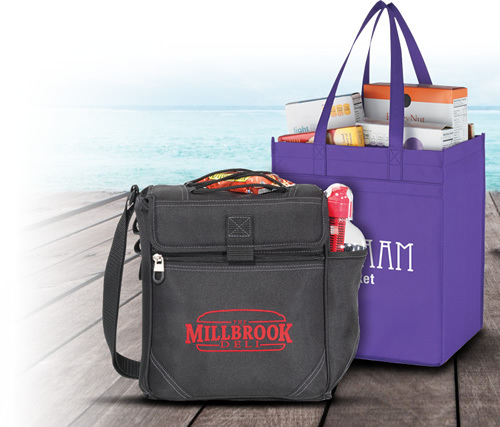 We will do a free one color logo imprint and free artwork eproof. 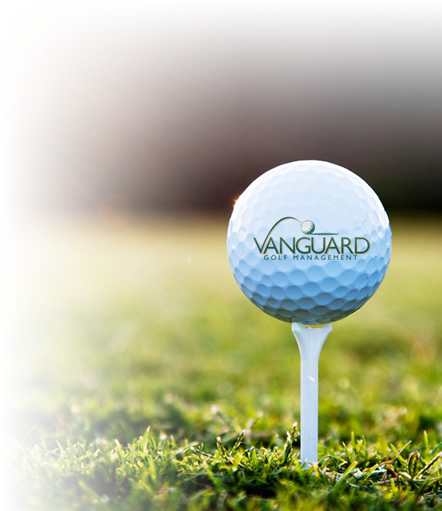 No set up fees are charged. 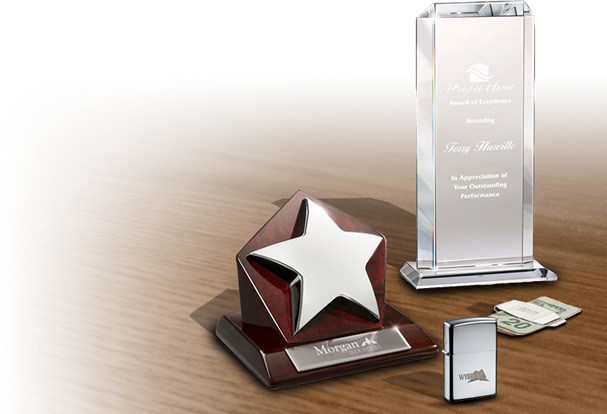 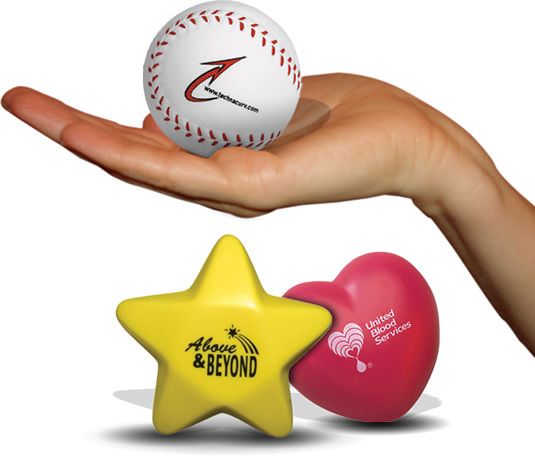 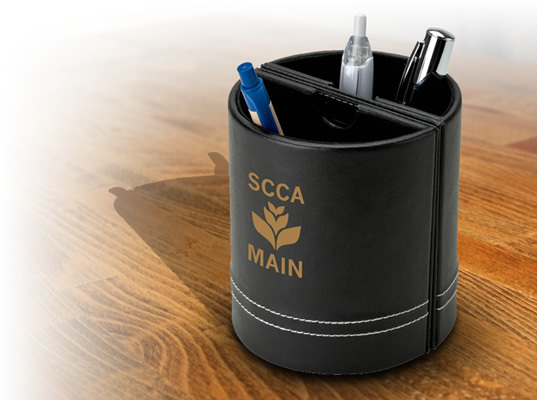 You can upgrade to a multicolored logo imprint for an extra charge, so that your company logo is easily visible. 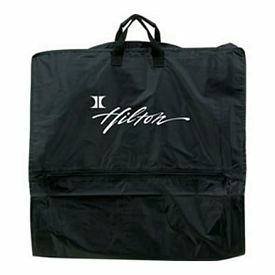 There is a free 24 hour rush service on the promotional luggage bags. 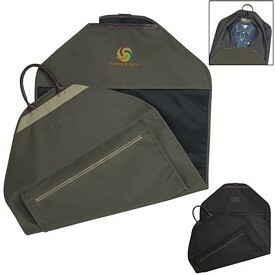 The Atchison Davinci Resort Gear promotional Duffel bags look classy with top grain leather patch and trim. 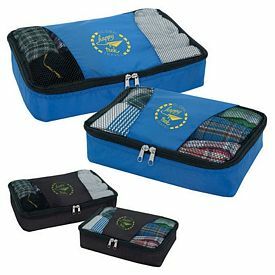 The interior of the executive bags are fully lined. 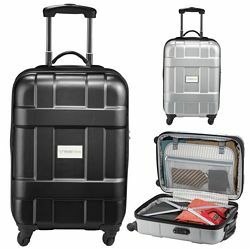 The primary compartment of the custom luggage bags is zippered and the bottom is board covered. 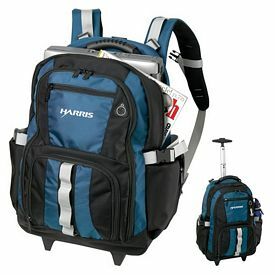 The shoulder straps are adjustable and detachable and come with leather pads. 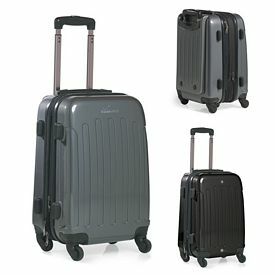 The material of the promo luggage bag is high quality metal hardware. 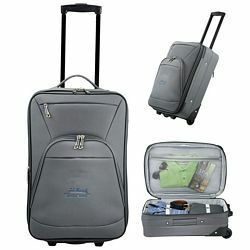 If you want smaller sized customized luggage bags then you can opt for the logoed Atchison Davinci Vacation valet. 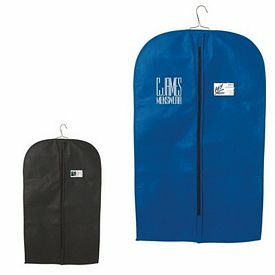 There are two outside zippered pockets with interior pleats. 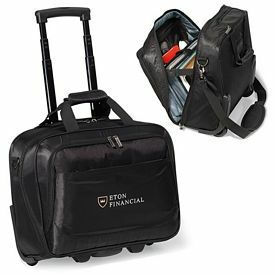 Top grain leather trim makes the promotional luggage bags look clean. 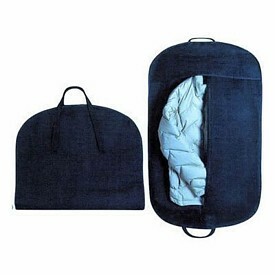 The hangers can be securely placed inside the fully lined interior bag which has a Velcro closure as well. 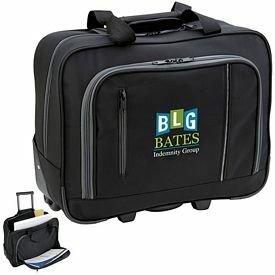 Promote your company with the logoed lightweight garment travel bags. 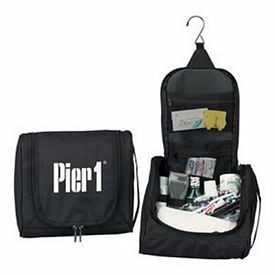 The customized travel bags have maximum packing space. 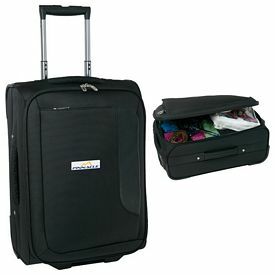 These promotional luggage bags are the one-stop solution when it comes to packing beautiful dresses and suits. 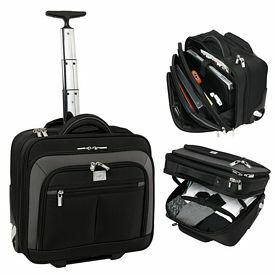 The front zipper increase accessibility of the luggage bags. 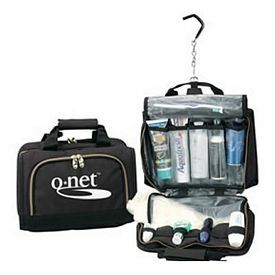 There is a clear vinyl pocket on the exterior of the branded bag where customers can display their valid IDs. 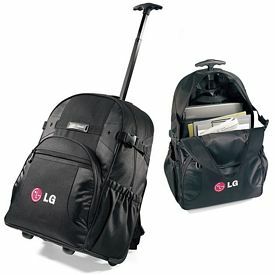 You will get the promotional luggage bags in black. 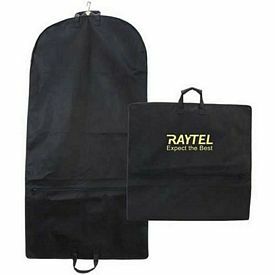 The customized Nylon Garment travel bags can be ideally used as promotional luggage bags. 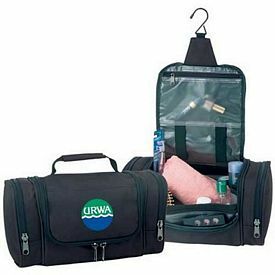 The large compartment is attached with a zipper and two handles. 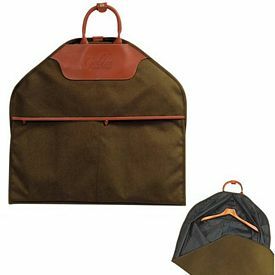 There is a hanger loop inside the bag. 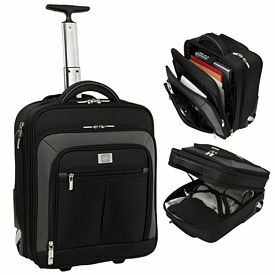 Shock your customers with our promotional Elleven Wheeled Security Friendly Compu-backpack. 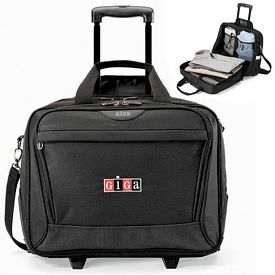 The promotional computer bags are TSA friendly. 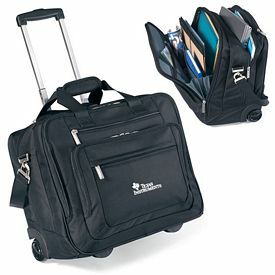 17 inch laptop compartments are in the main zippered segment of the travel computer bags. 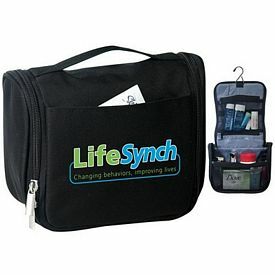 There is a zippered media pocket for travel accessories, file dividers, padded valuables pocket and earbud port access. 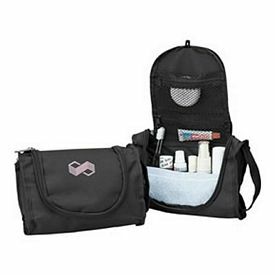 The exclusively designed front pocket is zippered and has a tech trap. 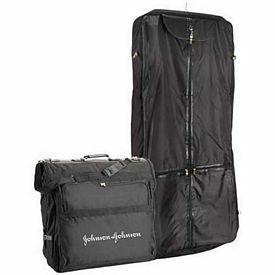 There are zippered pockets on all the three sides of the custom luggage bag. 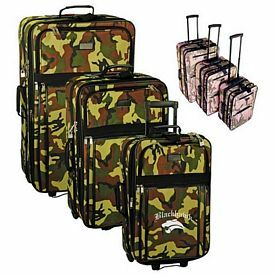 The back straps can be easily hidden and there is a carry handle so that you can carry the promotional luggage bag without much effort. 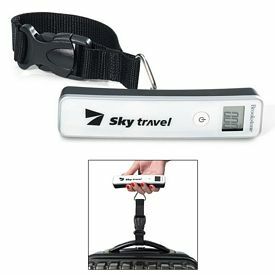 The inline wheels and telescopic handle provide easy handling. 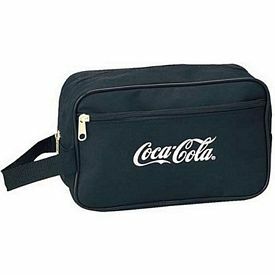 You can order the branded corporate travel cases with screen printed and embossed logos or embroidered company logo on the vinyl panel. 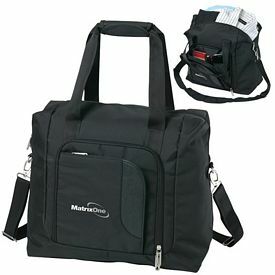 We have used Dot dobby nylon with scuba for the promotional computer bags. 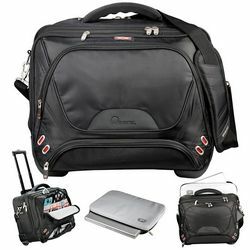 There is a free 24 hour rush service on the customized travel computer bags. 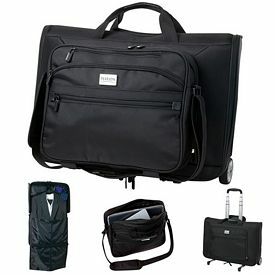 The Connect 20” Wheeled Promotional Duffel bags are classy and customized with U opening and wheels. 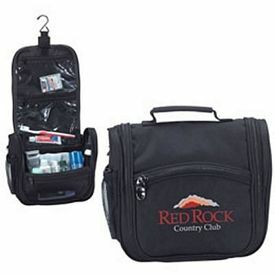 There are two front zipped compartments with additional side pockets, ID pocket, and a grab handle. 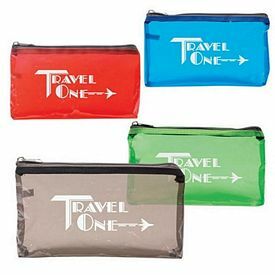 One of the front pockets has a deluxe organization for travel accessories.